Norway’s highest court (Høyesterett) has rejected claims by a powerful Norwegian dock workers’ union that they have exclusive rights to load and offload vessels. The landmark case breaks an alleged monopoly long held by Norway’s transport workers’ federation (NTF) and also rules that Norway’s agreement to abide by EU rules takes precedence over a constitutional clause. 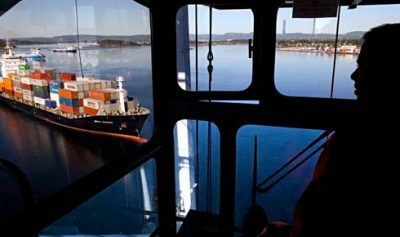 The dock workers who are members of NTF have fought for three years to demand that a Danish company, Holship Norge, must enter into a contract with their union and commit themselves to only use organized NTF members instead of Holship’s own workers when its vessels were in port in Drammen. When Holship refused, NTF and Norway’s largest trade union confederation LO launched a boycott of Holship, which took the conflict to court in an effort to have the boycott declared illegal. The dockers won at both the city and appeals court levels, but Holship appealed to the high court. The equivalent of Norway’s supreme court took up the case, not least because it also involved constitutional issues. While Holship argued that NTF’s boycott and demands for preferential loading rights violated terms of Norway’s market access agreement with the EU, the dockers claimed that the so-called EØS-agreement defies both constitutional and the European human rights convention’s guarantees for organizational freedom. NTF (Norsk Transportarbeiderforbund) has argued all along that “important principles” were at stake regarding their rights as members of a labour union. Now Norway’s highest court has sided with Holship and declared that the Norwegian dock workers do not have preferential loading rights. The decision is in line with an earlier decision, sought by the high court, from the European Free Trade Association’s own court in Luxembourg that the boycott was indeed at odds with European competition rules. It’s a major loss for NTF, which also has been involved in similar conflicts at other ports around Norway. Shipowners and harbor operators have claimed the union’s high wages and work practices have raised costs, created delays and reduced efficiency, but NTF was supported in its case by attorneys for the state. They felt obliged to defend the use of a boycott as legal in Norwegian labour disputes. As newspaper Dagens Næringsliv (DN) editorialized last month, the entire conflict results at least in part from Norway’s refusal to join the EU yet agree to abide by EU rules in order to trade with the EU. “We agree to laws and regulations that we have not been part of forming,” wrote DN, adding that Norway in reality is “as integrated into the EU as other European countries, just in a peculiar way,” and thus must conform to EU rules even with they clash with Norwegian laws and regulations. Norway’s highest court has clearly agreed. Its decision, that the EØS agreement basically overrides the labour organizational rights inserted into Norway’s consititution, is likely to revive calls that Norway should scrap the EØS agreement altogether. DN noted that the political desire to do so is limited, though, to Norway’s small Center Party, the Socialist Left party (SV) and the left wing of LO. It’s otherwise staunchly defended as the primary means of allowing Norway to sell its oil, seafood and other export products to EU members. Norwegian Broadcasting (NRK) reported on Friday that the high court decision will have ripple effects at all harbours in Norway. Those run by private operators instead of the public sector will be especially affected, some might say “liberated.” Many have been hit by strikes and labour disruption in recent years, including Oslo’s harbour, where Turkish company Yilport took over operations of the city-owned container harbour. It also has used its own workers, who are organized in labour unions other than NTF, and been caught in several conflicts. DN has reported that Yilport’s expenses have still been so much higher than anticipated in Oslo that it has demanded contract renegotiation. Labour conflicts at the Oslo harbours also resulted in the city’s new Labour Party-led government firing the harbour commission’s longtime leader, Bernt Stilluf Karlsen, and replacing him with SV politician Roger Schjerva. He immediately faced a variety of claims and demands from Yilport when he took over this fall. NTF officials were predictably disappointed by the high court’s ruling on Friday. Leader Lars Johnsen told NRK it would have “great consequences” for NTF members who may not be able to compete against workers willing to work for less and under different circumstances than they do. He predicted the ruling will lead to social dumping at Norwegian harbours. NTF wasn’t ready to give up its fight. “We have to look at the entire basis for our labour agreement, and see if we’ll need to establish entirely new agreements where preferential rights are excluded and they’re secured under the law,” Johnsen told NRK.